If you are like me, Thanksgiving means kicking back and watching some flicks. Not a football or parade fan, a good movie marathon and a bucket of popcorn can make for a special day for Norm and I, so I just wanted to share some of my favorite spooky flicks. Get your self to Blockbuster and enjoy them with me. If you have never seen this movie your in for a few good frights and some pretty good chuckles, if you haven't seen it in a while, you'll enjoy it all over again. Spooky but family friendly, even though it was made in the 80's it holds up today. This is a good flick starring Donald Sutherland that reflects on a "true" story of the Bell Witch. A period movie, the story-line and production of the movie makes it a must see for anyone at all familiar with the Bell Witch story. Again, based on a true story, this movie was Really interesting and deeply frightening. Not a slasher or horror film, the scares come from the presence of a demon and the fight for a young girls life. Good stuff. Once you see it, check out the true story. Deeply scary with terrifying ghostly creatures, this one may give you nightmares. So, of course, I loved it. Dark and twisted, it follows a woman into another dimension looking for her daughter in a scary abandoned town. Run when the bell tolls cause all kinds of bad stuff will come out to get ya. Wait till after dark to watch it. If you haven't seen this 1999 film featuring Catherine Zeta Jones and Owen Wilson, its worth a look. 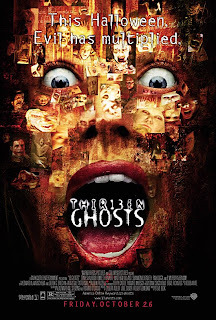 A psychologist takes a few people to an abandoned mansion to frighten them for scientific reasons, however, real frights ensue when restless spirits seek to destroy one of the special guests. Well, I hope these movies keep you busy. Please share some of your favorite ghost flicks here so that I can add them to my list as well.